Spokane City Attorney Nancy Isserlis looked around during a meeting with the police chief earlier this year and found herself in awe that the lawyers at the table were "three powerful women." 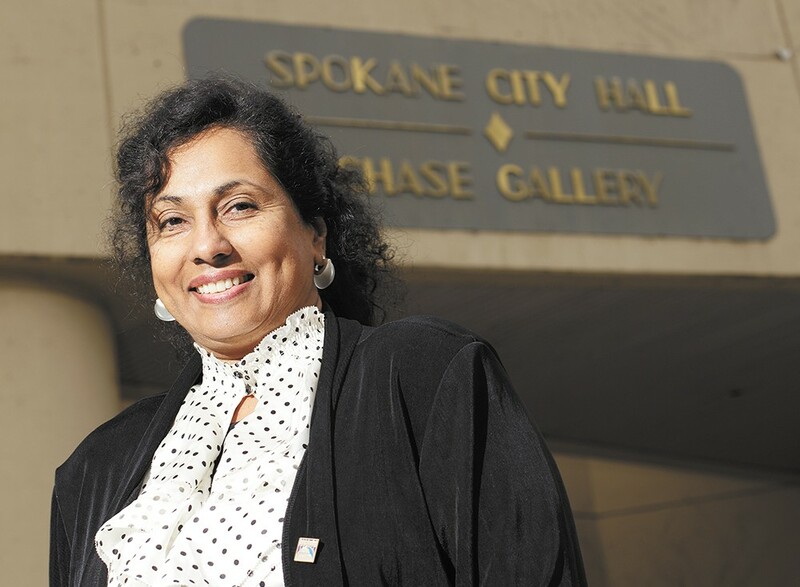 It may be 2014, but the scene was a departure for the legal department — Isserlis says she's Spokane's first-ever woman city attorney — and it's the sort of thing some people want to see more of at City Hall. "I've always thought that the best decisions are those made when a wide variety of viewpoints are represented in the room," Isserlis says. "Diversity just makes a place a better place to work." But in those terms, the city has a long way to go. Among the 25 city employees with the highest salaries, just five are women. (Isserlis is at the top of that group.) Include overtime to account for the pay employees actually took home last year and it's even worse: one woman in the top 25. Of the top 100 salaries — all over $100,000 — 16 are earned by women; among the highest paid, that drops to 10 women and just four employees who are non-white. Start comparing these numbers and the results are mixed. In Seattle last year, there were no women among the 25 highest paid and just two among those with the highest base salaries. But at the federal government level, women make up 44 percent of employees and 30 percent of senior positions, and in the population at large, about half are women. So the lack of representation in Spokane leadership is clear, but we're not the first ones to stumble here. Gita George-Hatcher used to lead affirmative action programs for the city and is now head of civil service. She hopes to recruit more women and minorities to city jobs. Yet, to really understand — and hope to ever fix — the underrepresentation of women inside City Hall, leaders are going to need numbers. Today, there is no comprehensive report they can turn to in order to gauge just how much work the city needs to do, and where. In Seattle, after a national study ranked the city as having the worst pay gap in the nation, the issue helped define the 2013 mayoral race, the city created its own report and task force, and the city council passed a resolution calling on city departments to figure out what was causing the disparity and fix it. Here, while our numbers may appear better than Seattle's, there's too much we don't know. At least that's the way Blaine Stum sees it. He's a member of the city's Human Rights Commission and the legislative aide to City Councilman Jon Snyder, and he's recently been trying to cobble together a look at this problem. In lieu of a city-issued breakdown, he's been poring over city employees' ID photos and searching for public records and Facebook pages to determine their gender in order to figure out the types of jobs women most often hold. He's found that less than a quarter of city employees are women and they're most often in secretarial and clerical jobs, a trend that mirrors citywide employment for women. Stum found pay gaps — disparities in what women and men were paid per year on average — ranging from $1,000 in the accounting department to as high as $16,500 in the police department, likely due to the types of jobs women hold. Still, his estimates are imperfect and he doesn't have racial data to consider. Stum has finished a draft report of what he found. He'll pass it on to Snyder and try to get the Human Rights Commission behind him on asking the council to take up the issue. Until then, his after-hours analysis is the best we've got and the results are stark. "Any demographic makeup should be representative of the community itself," Stum says. "It's not a good thing that our city government, as far as employee demographics, [is] so skewed in one direction as far as gender and also the types of jobs women are getting. That's something that should be addressed." Ask around City Hall about this and an underlying tension emerges: Is civil service to blame for a lack of diversity? Civil service, remember, is the testing process nearly all applicants for city jobs must go through. Approved by Spokane voters a century ago, it's meant to prevent cronyism. City leaders can't just hand jobs to their friends and family members this way. The testing system doesn't apply to department heads or assistant department heads (these are "exempt" positions), which the mayor appoints. Since taking office in 2012, Mayor David Condon has expanded the number of exempt slots in City Hall by reorganizing departments, drawing a court battle and heat from some who say it's undermining the citizens' will. To Condon and some in his cabinet, civil service is more like a straitjacket. Of course, they acknowledge, the system is valuable for fair hiring, but it limits their ability to target certain people who'd be best for leadership positions or certain groups they know are underrepresented at the city. "If they give me the list of three people and they're all men, OK," says Jan Quintrall, head of the city's business and developer services division, tapping her fingers on a conference room table. "I have to have real clear reasons to want to bypass them and it can't be, 'I'm sorry. I can't hire a man. I need to hire another woman.'" Quintrall says she'd like to see a higher percentage of city employees hired outside civil service. Maybe 10 or 20 percent instead of the current number, which amounts to about 6 percent. "Having a little bit of flexibility there might bring us a different outcome," she says. "It's probably time to have the conversation." Not so fast, says Gita George-Hatcher, chief examiner of the city's civil service commission. "I think that our system is far more defensible, with respect to trying to be nondiscriminatory, than you could be in a system where you're simply appointing people with no process or mechanism in place," she says. George-Hatcher was head of the city's affirmative action program until the late '90s, when a national movement against so-called "reverse discrimination" and a statewide initiative swept those policies out of most local governments. Since, she says, the department has been trying to increase diversity without the force of a mandate. George-Hatcher says she wants to see more frequent testing and more different types of testing for jobs at the city to help people who may have busy schedules or struggle on written tests. She's also planning to go out to neighborhood councils and groups like the local NAACP to get more people thinking about the possibility of working for the city. Among the highest paid employees last year, a big chunk of them work for the fire department and nearly all of them are white men. Assistant Fire Chief Brian Schaeffer says his department wants to remake its physical agility test over the next year to make it more fair to women.